When it comes to business, content makes the world go ‘round. When it comes to your business, your content can mean the difference between a few hundred random visitors and thousands of qualified leads. 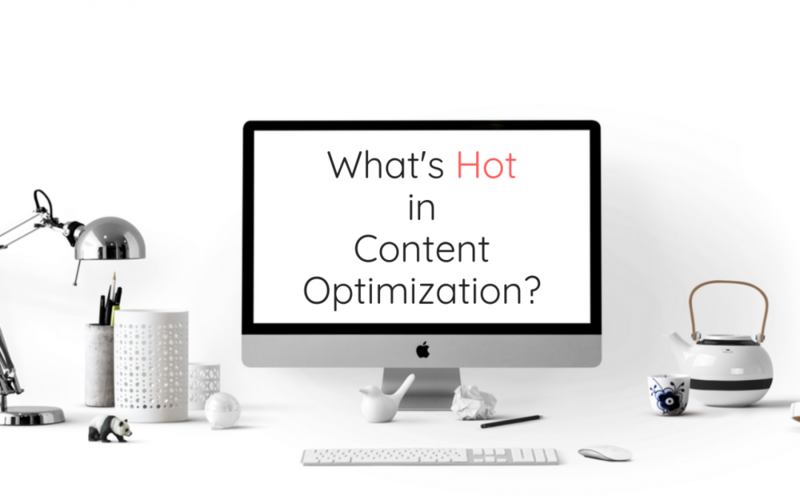 Content optimization is how your site is found so staying up on the most current strategies will make you more visible to your customers and prospects. Here what’s hot right now. As mobile has surpassed desktop use, businesses have had to make adjustments to accommodate their mobile customers and reach those mobile audiences. While it is true that Google gave a pretty hard push by requiring websites to have a mobile version, the truth is more and more companies are realizing that if they want to stay in the game they have to move into the brave new world of mobile. This means optimizing mobile sites and load time is a top concern. Did you know? 53% of mobile sites are abandoned if the load time exceed 3 seconds. Most people know how important meta keywords are to content, but the title tags and meta descriptions are often forgotten. Your meta tags give the search engines a lot of very important information about your site. You can research keywords to find the best ones for your site and determine which will work best to improve your search engine rankings. If you have been neglecting meta tags, you really can’t afford to do it anymore. The internet has given businesses an expansive arena for promotion – and intense competition. Learning how to optimize your content with meta tags can make a substantial difference in your site’s performance and search engine ranking. Did you know? Meta tags are integral to how a site is indexed in the search engines and 93% of all online experiences start with a search engine. Duplicate content is a term that many content managers have grabbed with both hands. It is well known that sites with content that is very similar can be penalized by the search engines. Creating unique content does improve rankings and it seems to be increasing in importance. Google is, as usual, very tight-lipped about the role that duplicate content plays in a site’s performance in the search engines, but, as they say, the proof is in the pudding. Sites with duplicate content simply don’t rank well. Did you know? The “duplicate content” restriction is not an empirical rule. There are times when duplicate content is acceptable, such as an except that links to the original site. Content optimization is constantly evolving. Google’s frequent algorithm updates and the continual advances in SEO mean that the content landscape is very fluid. If you want to stay on top of the game, you need to keep your ear to the ground and stay up with developments as they happen. Bookmark the CMC blog and check back often as we post all the shiny new advances in all things content. It’s your content, your business; we’ll help you make it great. Stephanie M is a writer living in East Central, Alabama, but she didn’t always lead such a peaceful, carefree life. A few years ago she made a daring escape from the “cube farm” at a Federal Agency in Washington, D.C. (after eight very long years) where she worked as an analyst focusing on disaster response, technical writing, program management, and FOIA.